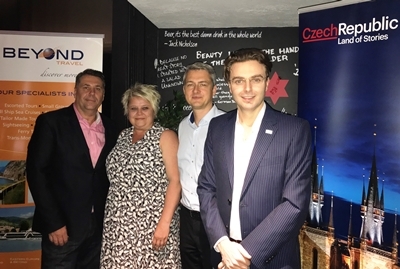 VISITING tourism body, Czech Tourism and European specialists for 25 years, Beyond Travel, joined forces in Sydney recently at Beer DeLuxe on King St Wharf to host the first evening of a series of Czech Republic agent information dinners and introduce them to a selection of popular Czech beers. The event was also attended by Ms Hana Flanderova, Consul General and Mr Tomas Kara, Deputy Consul General from the Consulate General of the Czech Republic in Sydney. Ms Flanderova said it was perfect timing for the visiting tourism body with the Czech Republic celebrating 100 years presence in Australia this year. Beyond Travel marketing manager Bryce Crampton said the events had been designed to increase awareness and update agents on the great value, ideal location in the heart of Europe and the numerous attractions the Czech Republic offers Australians travelling to Eastern Europe. He added, “With the challenge of the Australian dollar for travellers at the moment, Czech Republic offers amazing value for expenses on the ground in Czech, especially in comparison to other major tourist cities. “For example, the average cost per night of a centrally located four star hotel in London is A$385, in Vienna is A$295 and in Prague is only A$180. While the average price of a beer in Sydney is A$8 a local Czech beer, home to the famous Pilsen, is just A$2. The event included over 50 agents who were encouraged to complete a Czech Republic crossword to be in the chance to win numerous prizes including a beautiful Moser crystal glass wear. Similar sized events also took place in Melbourne and Auckland.